The two presses already were in the building when we got access to it. 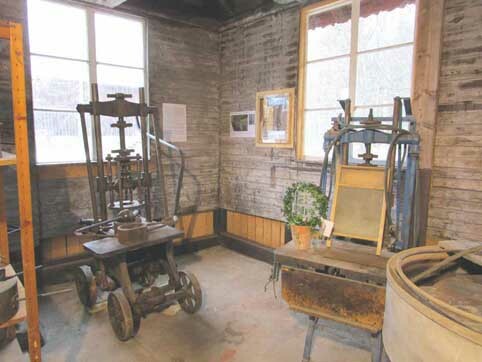 That means that both presses have been used for production by Bergdala glsbruk in historic times. Among other things, they have been used to make glass blocks for the decoration of the underground station T-centralen in Stockholm. Here are our presses, the manual and the pneumatic. By now they are cleaner - and we have moved them, so they no longer fit in the same photo. • The presser first takes care of the mould: cuts the glass when the correct amount has been delivered, puts on the top ring, pushes the mould in under the plunger. He then manoeuvres the plunger. He must press hard, to make the hot glass fill all crevices of the mould. For bigger pieces, sometimes it needed two persons for the pressing. • and lastly the taker-in who takes the pressed product to the annealing. The other press (the blue one) was pneumatic (assisted by compressed air), which made the presser's work much easier. We only have a couple of press moulds, for simple bowls. 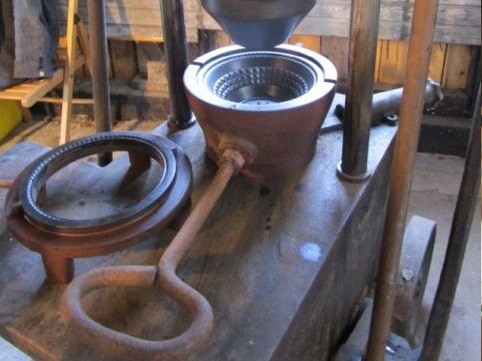 Press moulds could be complicated - below is a picture of a mould for a candleholder, with the candleholder in place. The photo was taken at the Flygt museum in Lindås. 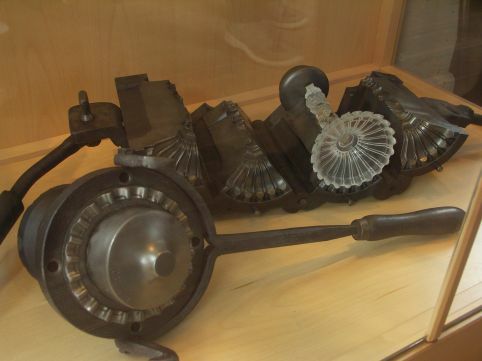 In our museum you are invited to try out things - we don't have any molten glass, but feel the moulds (heavy! ), to put on the top ring (remember that, in reality, all iron things are warm, about 400 Celsius: it was easy to get burnt! ), to push the mould into place (all the way to the stops!) and try pressing (press down the springs a couple of centimetres, hold for 5-6 seconds).